I really believe in eating healthy, but every now and then, you gotta live a little! I took SooFoo out on the town Sunday night to a local New York style deli and dueling piano bar, called the Derby Deli. 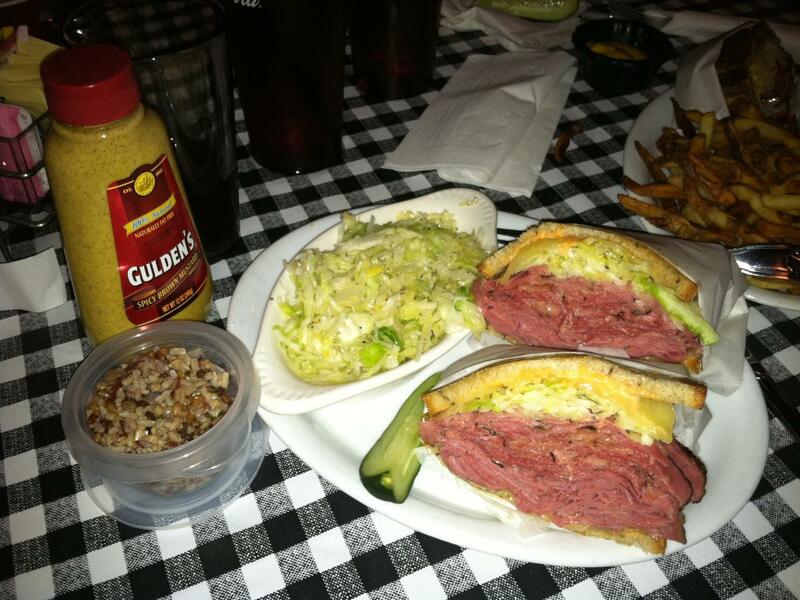 Again, it may not have been the healthiest selection on the menu, but my taste buds forced me to go with the “Laurel and Hardy”, which included hot pastrami and corned beef on rye bread. Yum, yum. I ordered coleslaw on the side, which I generally wouldn’t do because, contrary to popular belief, coleslaw usually isn’t so healthy and I’d rather spend calories elsewhere. However, I knew I wouldn’t be eating much of it on this night since I had SooFoo in my back pocket…well, my side coat pocket actually. It was all delicious, but as you can probably see from the photo, the portions were HUGE and all I could muster was a half sandwich along with the SooFoo. Oh, and I’ll admit, I enjoyed one New Castle brown ale to go along with it. A fine pairing and I wasn’t too weighed down so I could enjoy the party that much more. What a great night! Monday was Presidents Day and I cooked up a SooFoo breakfast fitting for a president! A SooFoo omelette, non-fat strawberry greek yogurt, and some banana slices. The omelette included 2 eggs, green peppers, and tomatoes– plus SooFoo of course. I’m not a vegetarian myself, but I’ve switched to Meatless Mondays to help with my health and to help me understand better how to prepare meals that don’t revolve around meat. What a great idea! I’m afraid lunch and dinner were similar to other days, just having SooFoo by itself as a side for lunch, and again mixed in tortilla soup to make a hearty dinner. After splurging a bit over the holiday weekend, it was back to health on Fat Tuesday (ironic, huh?). SooFoo cereal for an EARLY 5:30am breakfast. Nothing fancy–cold SooFoo and a little organic milk. Don’t knock it until you’ve tried it. Although, it may have been better with a little honey or peanut butter mixed in. I may try the latter tomorrow but I needed something quick so I can head out on my travels. I spent the better part of yesterday experiencing the joys of traveling. I have horrible luck with flights. Just ask anyone who has had the misfortune of being booked along with me. I’m sure everyone feels that way, but I think I’ve had some pretty unique experiences. Have you ever had hail puncture holes in your plane’s wings while on the runway, awaiting takeoff?? Have you ever been diverted and delayed for days in a place further from your destination than where you originated? Have you ever had an airline representative tell you, “We’re canceling all flights to your destination today because we’re not making enough money on them.” (won’t comment on the airline) It’s all par for the course for me. Luckily, yesterday was basically spent waiting out a little fog. When I finally arrived in San Francisco, and after getting some work done, it was time for dinner. 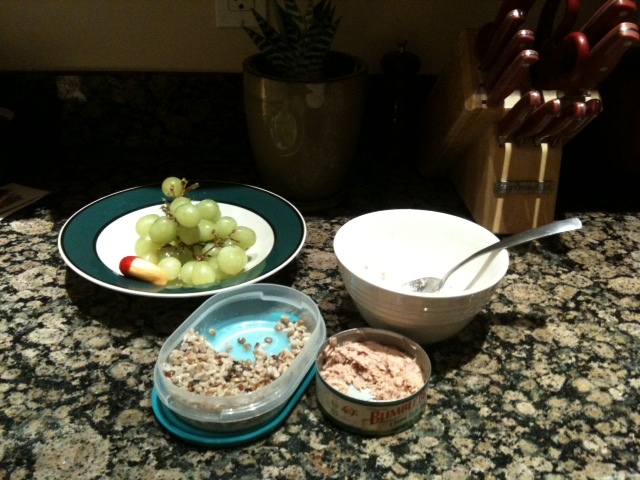 Fortunately, my home away from home was equipped with some leftover SooFoo, a can of tuna, and some fruit. I mixed the SooFoo(cold) and tuna with a little onion and dill and enjoyed along with some green grapes and low-fat Babybel cheese. Amazing how something so simple can seem gourmet by adding the SooFoo. I know I’m biased, but really, that’s pretty fancy for a bachelor! I’m especially proud as on business trips I usually go out and eat too much junk food, but this was perfect. I even slept much better and feel great this morning. Today marks one full week with having at least one serving of SooFoo at every meal, and I’m happy to say, I’m still loving the taste and am definitely feeling good! 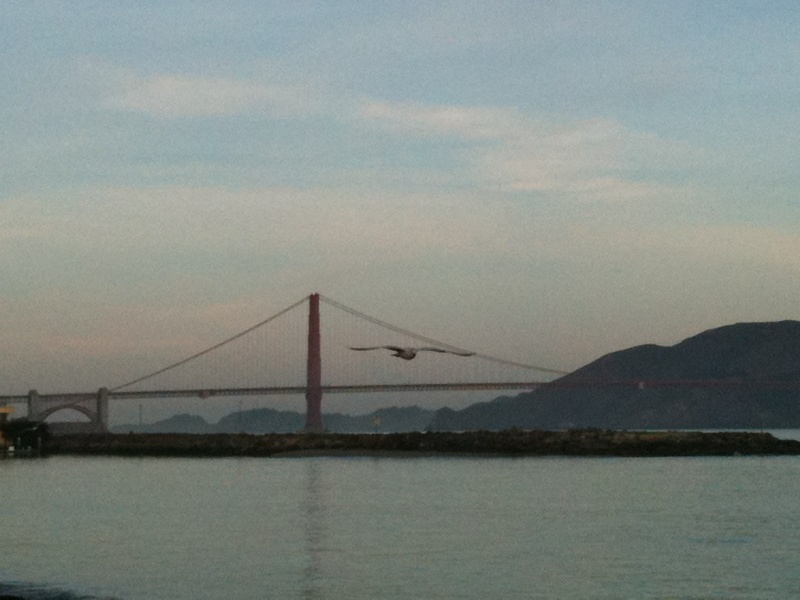 And who doesn’t love morning in San Francisco?? ?